For 200 years, the hero's magic pen has been passed on from generation to generation. The newest hero is Alice Goodenough, an 18-year-old junior from Washington High School. While her friends spent their summer working and having fun, Alice found herself doing battle with creatures most human beings don't even realize exist. A giant snake. A blood-sucking prince. A terrifying half-man, half-hedgehog. Dastardly dwarfs intent on mind-controlling everyone who uses a cell phone. After facing off with the dreaded dwarf named Sam Grayle, Alice finds her dreams plagued by two separate visions. In one, she's floating through a massive mansion filled with old, dusty furniture and drafty windows. Shadows dance across the wall. Children cry out in terror. A mysterious animal growl echoes through the halls. In her second dream, a terrible smoke-like creature roams the streets of Minneapolis, feeding off human victims while it plots a terrible revenge that threatens to have far-reaching consequences. Alice must decide which dream to pursue: does she foil the smoke-creature's plot or try to rescue the children from an unseen evil? A ship is coming. And aboard that ship is one of the most terrifying Corrupted creatures Alice has faced yet. In order to face her foe, Alice will have to do without the help of her scorned friend, Br'er Rabbit. Three mysterious golden coins. What is their purpose? Alice must find out, and in order to do so, she will need to use all of the skills she's learned so far. She cannot fail. Failure means a fate worse than death. Agnim the Mage haunts her dreams, using his terrible black magic to plague Alice with nightmares. 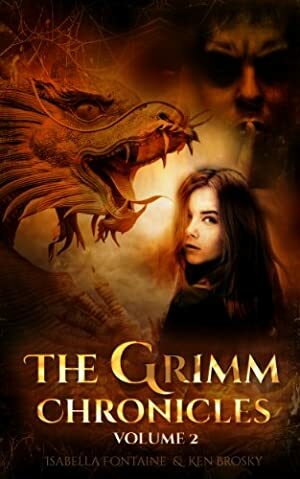 Once a character in the Grimms' fairy tales, his magical powers have stronger and stronger the more Corrupted he has become. He has foreseen a cataclysmic event that could mean the end of the world, and only the hero stands in his way. But in order to stop him, Alice will have to find him. And soon. Before Agnim steals her sanity and destroys her mind. Agnim knows her weakness. He knows her fears. He controls her dreams. He is the most dangerous Corrupted Alice has ever faced. There is no guarantee she can defeat him. The Golden Dragon will awaken. Log In to track Isabella Fontaine on eReaderIQ. to be notified each time the price drops on any book by Isabella Fontaine. to stop tracking Isabella Fontaine. Log In to track Ken Brosky on eReaderIQ. to be notified each time the price drops on any book by Ken Brosky. to stop tracking Ken Brosky. Log In to track Dagny Holt on eReaderIQ. to be notified each time the price drops on any book by Dagny Holt. to stop tracking Dagny Holt. Log In to track Chris Smith on eReaderIQ. to be notified each time the price drops on any book by Chris Smith. to stop tracking Chris Smith. Log In to track Lioudmila Perry on eReaderIQ. to be notified each time the price drops on any book by Lioudmila Perry. to stop tracking Lioudmila Perry. We started tracking this book on February 19, 2013. The price of this book has changed 118 times in the past 2,256 days. The highest price to date was $4.99 last reached on March 26, 2013.